"You did not call in a month." 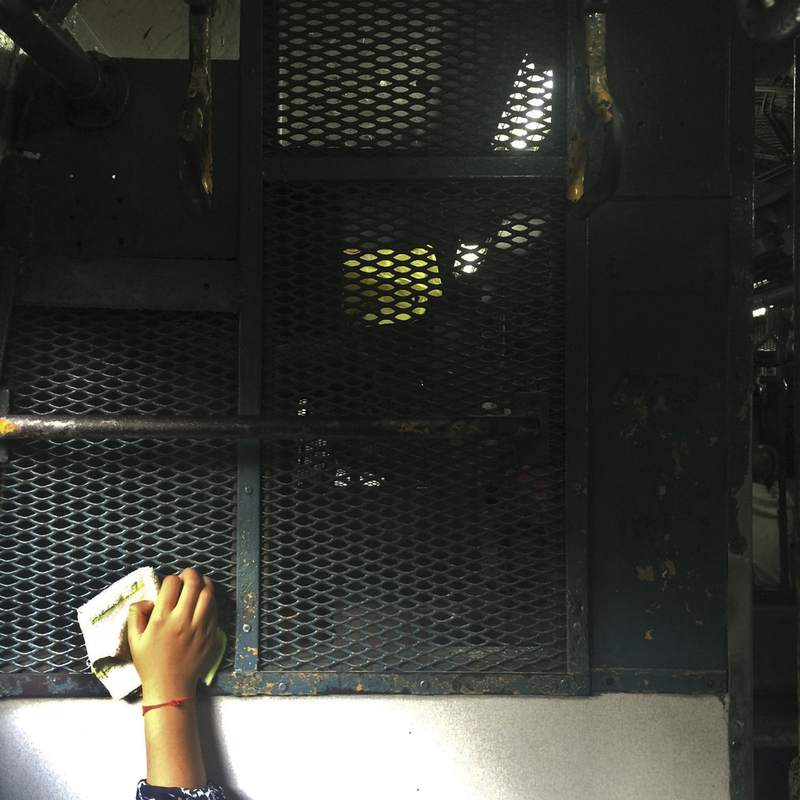 From the minute they got into the train, it was clear that they were having an argument. The girl was in tears, constantly wiping them off with her hanky. The guy tried to console her to not much avail. At Grant Road station, the guy got off and asked the girl if she was coming with him. "No, I want to be by myself for a while." "I am too short to reach the handlebars." Improvisations in the local train. 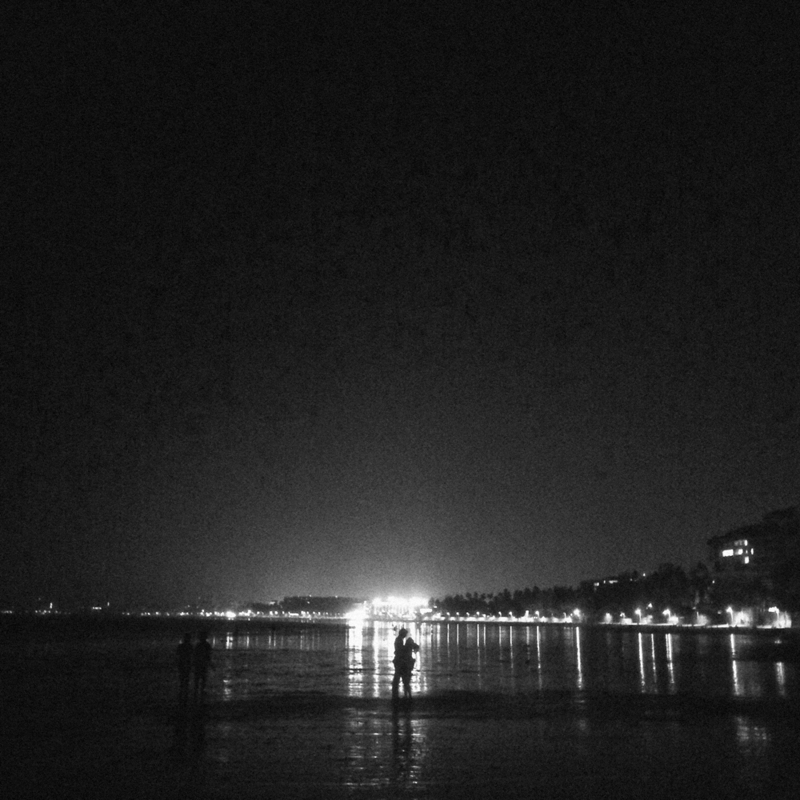 Lovers at Bandstand, trying to make their way to the sea with the help of a torchlight. 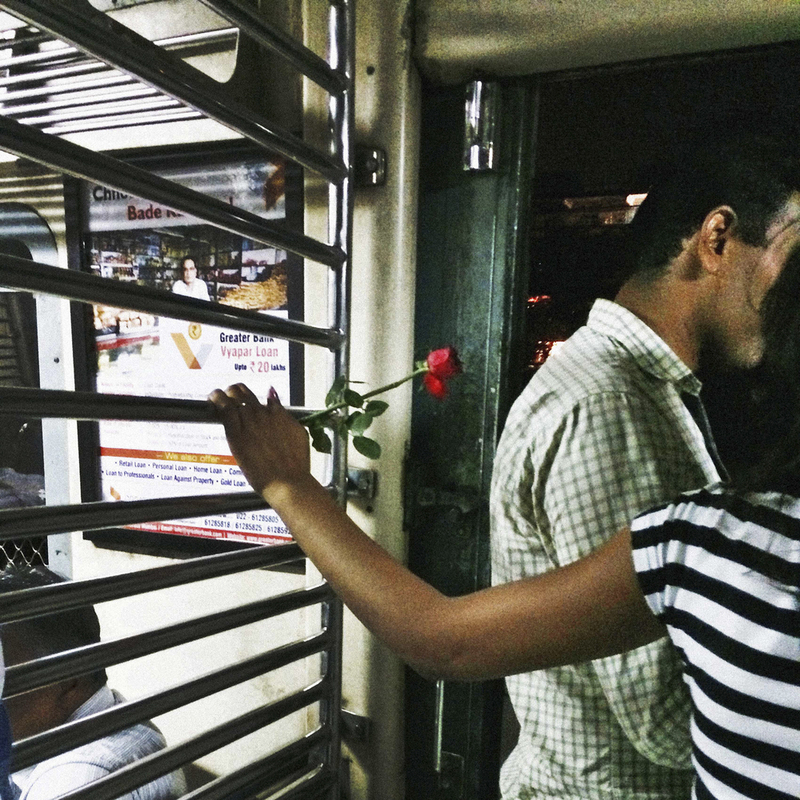 When did you take your first Love in Bombay photo? Did you know then that it would be a series? How many images have you made so far? I took my first photo of the series in November of 2014. It was just a nice moment in the train, of a girl holding a red rose that her boyfriend had given to her. At that time I had no idea that it was the beginning of a story or an inkling of an idea or anything. It was just a nice moment and nothing more. It would not be till about three months later that even the title “Love in Bombay” would come into the equation and even longer for me to realize that this would turn out to be something much more than I had ever anticipated. Since the time I made my first photo, I have made over a hundred photos, out of which I am happy with roughly 30 photographs. Public space is a dear cause for us at Lover. 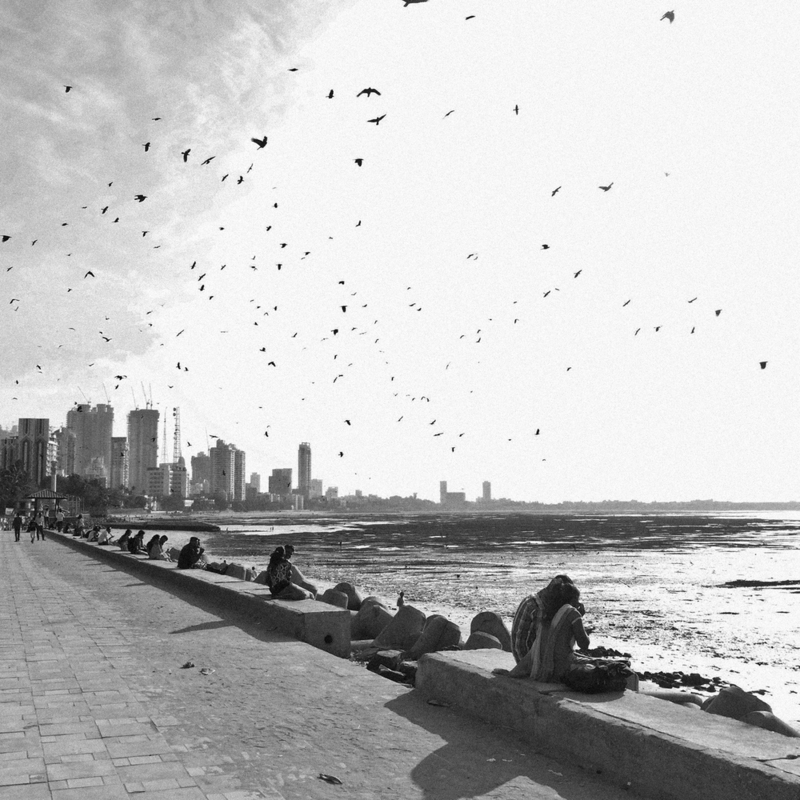 How do you feel lovers navigate and utilize public space in Bombay? There are different dimensions to this question. One is the lack of public space in general in a city like Bombay. The other is moral policing angle. An incident took place around six months ago where the police raided hotel rooms in Madh Island and arrested couples from the room on account of ‘public indecency’. This gives rise to questions of privacy and about is there any space for love in a city like ours. If you look closely, the lovers answer this question with grace. When you are driving by Marine Drive, you will see couples seated equidistant from each other, like as if there is an invisible radius drawn around each of them. This is the radius of privacy and mutual understanding. When you are passing by Marine Drive or happen to be at Chowpatty at 2 pm on a hot April’s day and you see couples making out, or walking hand-in-hand, or simply staring out at the sea while leaning on each other, you know that they are relishing a few moments of privacy. It is through an understanding of how the city works and a sense of being one amongst many that lovers in Bombay navigate and utilize public space. What made you shoot the series in black and white? Nothing in specific, I like the black and white medium a lot and happened to shoot that way. I read somewhere that these are primarily cell phone photos. Is that true? What are your thoughts on cell phone photography and the relative invisibility it affords you? This series is shot entirely on my phone. I used to be apprehensive about shooting on my phone and of Instagram initially, but once I got myself the iPhone, it opened me up to a whole new world. I began enjoying photography again, realizing the joy in just making simple photographs. What I love most about cellphone photography is that it strips off all the formalities that photography comes with and allows the photo-maker to focus on that one thing that is most essential to the medium: what one sees. What are the challenges you face while photographing such intimate moments? I think the biggest challenge is to not intrude. I have to respect the fact that the people I am photographing are sharing a moment of privacy and I should in no way ruin that. I have let numerous photos go by and have not made a photograph for the simple reason that I would be ruining the moment. I have a separate folder in my head for such images called “Only For Me”, haha. A photographer can, a lot of times, get carried away in the exercise of making the photo without taking anything else into consideration. I have had my share of difficulty with the same as well, and still do, but I am trying to improve with every passing day. Are you a romantic? Is your work a reflection of that part of yourself or is it something else? Well, in one word, yes. Yes, I am a romantic. I romanticize everything around me. Love, loss, longing, melancholy, nostalgia.. anything. But there are not too many things I romanticize more than Bombay. I mean, it is supremely easy to romanticize this city, really, and so many people have done it. So this work, I would say is the reflection of my feelings towards the city more than anything else. I come from a small town, Shillong, and the idea of being able to live and survive in a city like Bombay and to be able to understand how it works thrills me to no end. Public displays of affection are generally considered a taboo in India. What are your thoughts on moral policing and have you witnessed it while shooting? I am totally against moral policing and think it is simply ridiculous. I feel it stems from thoughts that are archaic and should be done away with. There is nothing wrong in two people falling in love and expressing their feelings in public. If it makes you uncomfortable, don’t look! But you don’t have the right to tell them to stop. I haven’t witnessed any incident personally, but as I mentioned before, the Madh Island incident is one that created quite a buzz for a while and was utterly disturbing. Regardless, your project seems to have elicited a very warm and positive response. What is some of the feedback you have received? Haha, the warm and positive response is something that has come only recently. A lot of people perceived what I was doing as creepy and stalkerish. But I try to not think about feedback in general so much. I have a few people I look up to, mentors, whose opinions matter and they seem to believe in this project and that is something I am glad about. Is the project still ongoing? What is the end goal? The project is still ongoing. I am working towards making a photobook out of this. Photographer Anurag Banerjee lives and works in Bombay. Find his portfolio here and follow him on Instagram at @banerjee.anurag.